India has a rich tradition of stonework. 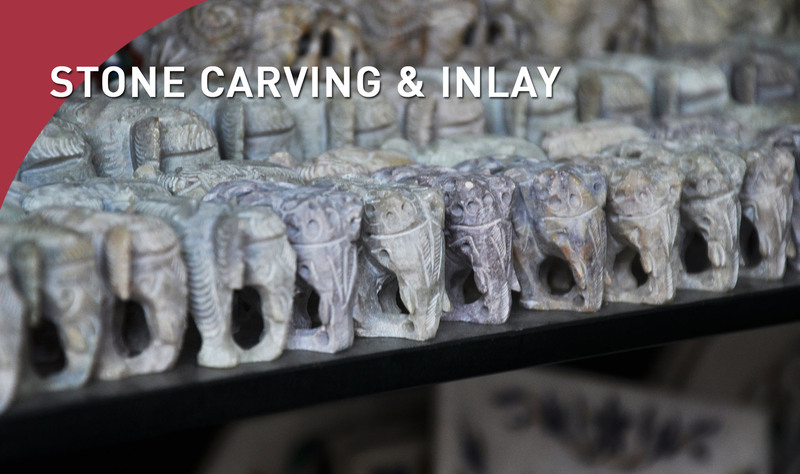 Agra has been a center of stone carving since the middle ages, and modern artisans produce beautiful pieces of marble, alabaster, sandstone, and other materials. These are intricately carved with floral patterns, filigree, and latticework. Popular items include nesting animals, lamps, table tops, containers, tiles, bowls, boxes, vases, paper weights, idols, and figurines. The European tradition of Pieta Dura was brought by travelers to the court of Shah Jahan. It evolved into the art of Parchinkari and used in the Taj Mahal. Modern artisans create exquisitely detailed marble objects inlaid with semi-precious materials, like jasper, coral, topaz, cornelian, onyx, lapis lazuli, malachite, turquoise, paucha shell, and others, to make intricate colorful patterns. Popular items include table tops, vases, boxes, coasters, animals, photo frames, and miniature Taj Mahal memorabilia.